A Critical Resource with Information You Won't Find Anywhere Else. Dentists of all specialties prescribe drugs for their patients, from pain medications to sedatives to antibiotics, and know all too well that making an evidenced-based decision on which drug to prescribe is more than just looking up a drug on the computer or PDA and requires more comprehensive consideration than the current drug reference books offer. For example, should an antibiotic be prescribed for implant placement or for sinus augmentation procedures? If so, what antibiotic is recommended (backed up with references), when should it be started, and for how long? Which is the antibiotic of choice for an odontogenic infection and how do you know if that antibiotic is working? Improve Your Decision Making with this Essential Guide. 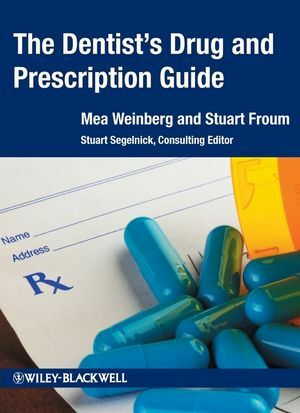 The Dentist’s Drug and Prescription Guide is the only book to offer comprehensive coverage of this topic and has quickly become the go-to reference for dental students, general dentists, periodontists, oral surgeons, dental hygienists. Instructions and guidelines for the patient on how to take the drugs (e.g., to avoid GI upset when taking antibiotics acidophilus or yogurt can be taken). Plus, sample prescriptions, coverage of proper documentation in the patient's chart, and more! Mea Weinberg, DMD, MSD, RPh, is a practicing periodontist and licensed pharmacist, giving her a unique position in the fields of dentistry and pharmacology. She is a clinical associate professor of Periodontology and Implantology at New York University. Stuart J. Froum, DDS is a Diplomate of the American Board of Periodontology, Clinical Professor and Director of Clinical Research at the Department of Periodontology and Implant Dentistry, New York University Krieser Dental Center. He maintains a Private Practice limited to Periodontics and Implant Dentistry in New York City. He has lectured nationally and internationally, has authored over 100 published research articles, and authored and contributed to five books related to periodontics and implant dentistry. He is the editor of the book “Dental Implant Complications: Etiology, Prevention and Treatment”. Dr. Froum is President Elect of the American Academy of Periodontology.